The Aviva Premiership and RaboDirect Pro 12 reached the end of their regular seasons this weekend, while the French Top 14 play-offs began. Which games produced the heroes and villains? Harlequins won their last five Aviva Premiership matches on the bounce to sneak into the title play-offs just as the back door was closing. Bath, who had been in the top four for all but one week of the season, only needed a draw in Saturday’s clash at The Stoop, but Quins won 19-16 and took their place in the title shoot-out. Skipper Chris Robshaw made sure the London team executed the correct tactics at the correct time to frustrate Bath in the closing stages. Yes, there were mistakes, but the back row showed why he is the England captain, with cool-headed leadership. He doesn’t do a lot of shouting and ranting, but that doesn’t stop Robshaw being an effective skipper. The fans at Franklin’s Gardens certainly got value for money this weekend as Northampton ran in no less than 11 tries to beat London Wasps 74-13. Needing just two points to guarantee a home draw in the play-offs, the Saints went 13-0 down, but came roaring back to take the lead – then kept their collective foot on the gas right to the final whistle. With the tries shared by eight players, it is impossible to pick out an individual saint from the ranks of the men in green. There were moments of individual brilliance from Ben Foden, Ken Pisi and Stephen Myler among many others, but the whole team can be proud of the way they carried on playing to the last. Ashley Beck gave himself and his Ospreys team-mates something positive to remember as the region heads into the off-season and Beck books in for a hip operation which will keep him out for six months. He scored two tries in the Ospreys’ 45-20 win over Connacht, and the second score was particularly good as Beck’s great footwork prised open the Irish defence. The Ospreys had nothing but pride to play for, as they were already guaranteed European Rugby Champions Cup qualification and could not make the RaboDirect Pro 12 play-offs, but they finished a frustrating campaign in style. James McKinney was Man of the Match for Ulster as they ensured they went into the RaboDirect Pro 12 play-offs in winning form. They beat Munster 19-17 at Thomond Park, thanks to four penalties and a conversion from outside-half McKinney. Ulster boss Mark Anscombe picked a young side for this game, resting some of his front-line players as their play-off spot was already guaranteed. McKinney, 23, had only made three other league starts for Ulster this season, but his lack of experience didn’t stop him producing a faultless place-kicking display and piloting his team to a memorable win against tough opponents at a difficult ground. 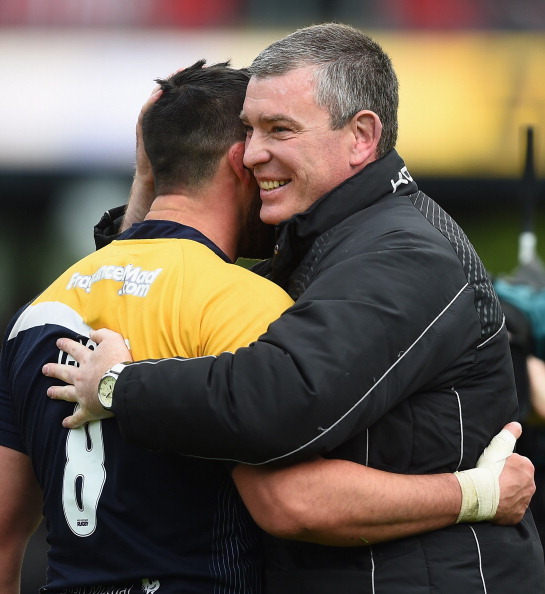 They were relegated from the Aviva Premiership last weekend but Worcester showed pride and character, coming from 10-0 down to win their last game of the season against Gloucester 28-27. It is all too easy for teams with nothing to play for to capitulate – just look at Wasps! But Worcester gave their long-suffering fans a win to take into the summer, including a magical try from Josh Drauniniu, which brought a new meaning to the phrase “dancing feet”. 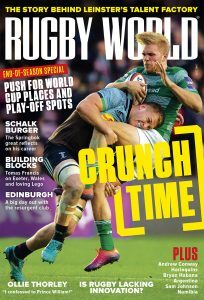 Concussion and player safety – it’s been a hot topic all season and new IRB protocols were supposed to protect players from continuing with a head injury. Tell that to Florian Fritz, who was scandalously and callously sent back out onto the field by Toulouse boss Guy Noves after he had knocked himself out on Francois van der Merwe’s knee. Take a look at the video and see if you can think of a worse instance of common sense being totally ignored. If the rules allow for this behaviour by the coaches and match officials, the rules are wrong. If the rules do not allow for it, someone should be punished. It does not matter how important a game is – and this was a massive Top 14 play-off. Players’ lives and mental well-being are more important. Bath needed at least a draw at Harlequins to maintain their place in the top four of the Aviva Premiership and go into the play-offs. They were trailing 19-16 as the clock went into red time at the end of the game, but they had possession and forward momentum around the Quins’ ten metre line. Instead of coolly going through a few more phases and trying to force their opponents to give away a penalty, or at least trying to get closer to the line for a drop-goal attempt, George Ford decided to have a go from 48 metres, with a gusty wind blowing around him. His shot got nowhere near the target, referee Wayne Barnes blew for full time and that was it – Bath’s tilt at the title was over. It was a shame Ford acted so rashly at that moment, as he had done many fine things during the game. But a playmaker and goal-kicker has to make the right call at the most pressurized times, and Ford got it wrong. He finished the regular Premiership season as top points-scorer with 250. What he would give for three more. When Wasps went 13-0 up after 15 minutes against Northampton at Franklin’s Gardens, their travelling fans must have been hoping for an upset in their last Aviva Premiership match of the season. All they were hoping for 65 minutes later was that the ground would open up and swallow them and the Wasps players and coaches, as they conceded 74 – yes, 74 – unanswered points and sunk to their heaviest ever league loss. Director of rugby Dai Young did not put out his strongest side, but he cannot have imagined that his players would capitulate so badly. Sloppy, scrappy, disorganised – they were clearly not mentally right for the match. Wasps will still be playing for a place in next seasons European Rugby Champions Cup, as they were secure in seventh spot in the table, but that will be of little consolation to the fans who made the journey. Young said: “It (the game) gave us the opportunity to play some players who haven’t had a lot of game time, but we’re all pretty embarrassed by that performance.